Addison Farms Vineyard is a family-owned vineyard and winery. We are in Leicester, NC, 14 miles northwest of Asheville, NC on NC Hwy 63. Our family has farmed this piece of property for over 75 years, raising tobacco, cattle and other crops. In 2009, we added a new product to our farm. Addison Farms planted the first acre of our vineyard. Additional plantings were completed in 2010-2015. Our vineyard now covers six acres, with an additional two acres under our management. The vineyard is at an elevation between 2250′ and 2300′ and current varieties include Cabernet Sauvignon, Cabernet Franc, Sangiovese, Montepulciano, Petit Verdot, and Petit Manseng. Enjoy an aerial view of our beautiful vineyard! Our tasting room was completed in late 2012. Please see our website at addisonfarms.net for more information. You can find hours of operation, directions, and other information. You can also ‘like’ us on Facebook at facebook.com/AddisonFarmsVineyard, and follow us on Twitter and Instagram @addisonfarms. Gwinn 2013 – pinot gris. Our 2013 Pinot Gris has a nice acidity, with notes of lemon, pear and melon on the nose. This wine will pair nicely with roasted pork or chicken fettuccine alfredo. Crown & Plough 2013 – sangiovese. Wonderful acid, a nose of strawberries and raspberries, and a light style con- tribute to the food-friendly nature of this Sangiovese rosé. Pair this wine with light pasta dishes, raw or steamed oysters, or a salad with raspberry vinaigrette. Coming Home – cabernet sauvignon, cabernet franc, and petit verdot. We are excited to share with you the full-bodied structure, with a hint of cherries on the nose and a fruit-forward expression on the palate. Pair this with what Cabernet pairs with best: a tasty steak from the grill! Five Twenty-Nine 2013 – barbera. Barbera has been grown in Northern Italy for centuries, and known as the quintessential ‘wine of the people.’ This wine has mild tannins and high acidity giving it strong fruit flavors of currant and blackberry with notes of spice. 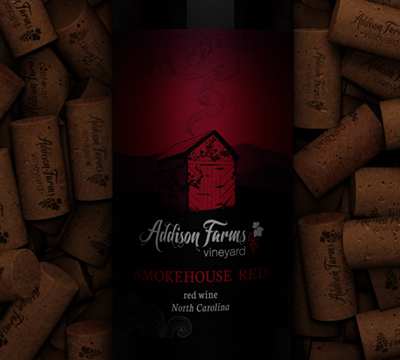 Smokehouse Red – chambourcin and sangiovese. A blend of Sangiovese and Chambourcin. Chambourcin is a French-American hybrid with a deep, rich color and wonderful structure softened with Sangiovese. Gratitude – chambourcin. A dessert-style wine made with 100% Chambourcin and aged in American Oak for 24 months. 6% residual sugar that is well balanced with Chambourcin’s common acidity.